For more than two millennia, philosophers have grappled with life's most profound and "eternal" questions. It is easy to forget, however, that these questions about fundamental issues like justice, injustice, virtue, vice, or happiness were not always eternal. They once had to be asked for the first time. This was a step that could place the inquirer beyond the boundaries of the law. And the Athenian citizen and philosopher who took that courageous step in the 5th century B.C. was Socrates. 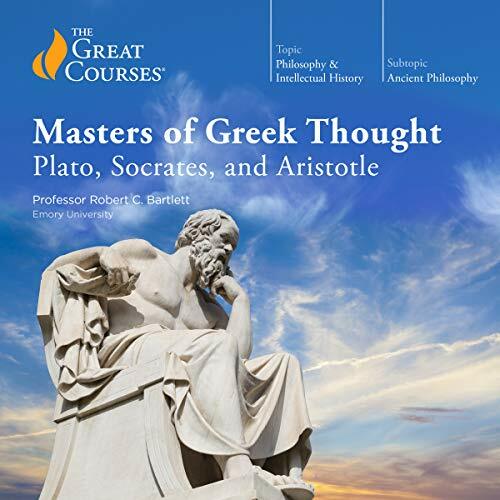 In this intellectually vibrant - yet crystal-clear and accessible - series of 36 lectures, an award-winning teacher provides you with a detailed analysis of the golden age of Athenian philosophy and the philosophical consequences of the philosopher's famed "Socratic Turn": his veering away from philosophy's previous concerns with the scientific study of nature and the physical world and toward the scrutiny of moral opinion. After Socrates, philosophy would never be the same. You learn that much of Socrates's philosophy is captured in the writings of his contemporaries and followers, including not just Plato and Aristotle, but also figures like Xenophon, a great thinker and military commander, and the comic playwright Aristophanes. Professor Bartlett takes you through Plato's most important dialogues - where Socrates is the protagonist - and shows how they convey the core of Socrates's philosophy. He then moves on to Aristotle, who did more than anyone to establish a comprehensive system of philosophy in the West, producing work encompassing morality, politics, aesthetics, logic, science, rhetoric, theology, metaphysics, and more. I bought this course to freshen up my knowledge, having spent a while away from the works of Plato (and never having spent much time reading Aristotle, and hoping to use this course to inspire me so to do). Professor Bartlett lays out a very clear outline of each lecture, and has a definite architecture that he lays out in the first lectures and sums up with in the last. This organization is particularly useful in the latter part of the course, where he presents some very complex, nuanced and occasionally even contradictory arguments from Aristotle's Ethics and Politics (these works are the meat and potatoes of the entire section on Aristotle). I particularly enjoyed the professor's ability to keep the various characters and frames of reference (vital to understanding what Plato is doing in the dialogues, as Prof. Bartlett makes clear) in the picture. I feel that my understanding of the Apology, Euthyphro, Republic and particularly (if surprisingly) Aristophanes' The Clouds has been deepened considerably. Note that Aristotle's natural philosophy works and metaphysics are mentioned but not discussed here, the focus being Aristotle's takes on morality, virtue and the good life, which dovetails nicely with the earlier part of the course. The time spent with Xenophon's Socratic dialogues was a nice surprise, as I hadn't encountered them before and they form a refreshing counterpoint to Plato's far more ironic and subtext-laden dialogues. What disappointed you about Masters of Greek Thought: Plato, Socrates, and Aristotle? This course focuses on the life of Socrates and the lives of his students and contemporaries. The story here provides a cultural and contextual background for these major Greek thinkers, but unfortunately gets caught up in the details of ancient Greek social history without giving much attention to the tenets of the philosophy. Of course, some points of Socrates' teachings are necessarily described, but I found this course wasn't at all what I was looking for, and I found it rather boring. Probably not, unless I got a very good recommendation for a course that fulfills my desire to have someone deeply explain the ideas (as opposed to the history). Did Professor Robert C. Bartlett do a good job differentiating all the characters? How? Yes, he is an excellent orator and very skilled at weaving information into a followable storyline. This course would be better categorized and described as "History of Philosophy." It's great if you want to understand the history of philosophy and the relationships between some of the major Greek philosophers. It's not the best if you want to learn about the intricacies of their ideas. An excellent introduction to these great men and philosophy in general. Worth a listen even if you have studied philosophy for a while. The professor is very good at making these philosophers relevant to today and explaining what their dialogs (in Socrates' case) or books (in Aristotle's case) mean. He did such a good job it took me a month to finish this course because I would often end up listening to the play, dialog or book he was talking about for free through LibriVox (why does Audible overcharge for those things?). Here's a mnemonic I use: think of three Greeks in their togas in a SPA, therefore you'll know the order that they come in (S)corates, (P)lato, and (A)ristotle. The professor really seemed to focus on Plato's dialogs that involved Socrates and therefore I would say the Plato part of the lecture was really about Socrates. The professor does something I really liked. He demystifies Socrates and puts him back down to earth. He'll say, for example, that the Republic is not really about a utopian state but is about how to understand what justice is within an individual and even as Socrates clearly states it's just a way to magnify the pieces that make up the whole within the individual the same way a sign written in bigger letters allows one to see better. Even the allegory of the cave is not strictly speaking about philosophy, but is more about our political understanding of the world (I think the professor says it that way, but he is a Political Scientist and sees the world that way). The professor gives a very good contrast between Socrates and Aristotle. Socrates would say that The Good (Virtue) is depended on our Knowledge and The Bad (Vice) is done because of the ignorance we have. Incontinence (the lack of control we have over ourselves or thoughts) is due only because of our ignorance, and therefore we never can knowingly do bad. Aristotle would say that we can knowingly do bad things to ourselves and we do that in spite of our knowledge. I really loved what the professor had to say on Aristotle's ethics, and I ended up listening to that with LibriVox. I never would have been able to follow that book without this lecture telling me what he was really saying (Aristotle is a miserably poor writer, but is always worth while wading through because he sees the world unlike anybody else). In brief, don't let the world distract you from what is unimportant and focus on the contemplative instead and wake-up! This is great coupled with Plato's readings. I have ONLY read Plato's Republic (and it was years ago) but this audiobook reminded me of how Socrates has so thoroughly shaped the philosophy I follow. I have a great loyalty to 'justice'. It has also motivated me to look at Plato's other works and revealed to me so much more about Socrates than I expected. I listen while I go about chores or other jobs that don't require my 100% attention (like at work while making gels, making solutions, purifying proteins, etc [I work in a lab]). I've found that it GREATLY settles my mind. After listening, I feel enthralled but so much more stable and satisfied. If you care about Justice, this is an informative and fulfilling listen. Delightfull, very clear. I am sure to hear it a couple more times so as to take in more of it. Im so glad I had a chance, by means of this audiobook, to come it contact with such elevated material. The halting speaking style and bad audio recording, which made the ends of sentences and the ends of many words taper off into inaudible mumbles, combined with a lack of structural flow and arc, made for a difficult lecture series to follow. Having said that, Professor Bartlett has some outstanding and clear-minded insights into his subjects, that I was very impressed by. I think I would have enjoyed it more if I were actually in a classroom and could hear him better. This is the second Great Courses I've listened to and the speakers seem to be bound by a formula that slows the momentum of the content. "This is what I'm about to tell you; this is what I'm telling you; this is what I told you." The speakers have no personal opinions or personalities and seem to be reading a manuscript that ends in the sound effect of canned clapping. These speakers have won awards for teaching but none of their talent shows through. The content could be exciting shared by a passionate individual but just feels like a list read by a guy with a doctorate in reading. About as thorough of a survey as you can get with Aristotle, Socrates and Plato. Great detail concerning "The Republic".... "The Ethics".... "The Politics" Great coverage on Socrates despite his lack of writing. I especially enjoyed the last 6 hours or so on Aristotle, I recommend it for this section alone. Probably will require at least two listening's to get the most out of, or great ability to pay attention and to focus. thought it was great. learned a lot. made me want to learn more. well structured, enjoyed every moment of it. would love to hear the professor take on oriental philosophy as well.